The One God is a book of Revelation given by the Creator of all life to the human family through the Messenger Marshall Vian Summers. Here God is revealing the greater reality of the Divine Presence, both in our world and within a Greater Community of intelligent life in the universe. This opens the next chapter in the progressive Revelation of God’s Reality, Will and Purpose for the human family as it now stands at the threshold of great change and instability in the world. Throughout human history, the Creator has given Revelation and Wisdom to meet the growing needs of people and nations at great turning points in the evolution of humanity. Through the Prophets, Messengers and revealed Teachings of the past, God’s progressive Revelations have flowed into human awareness, advancing our understanding of the One God and re-awakening a deep memory of the Divine Presence in our lives. Now God is speaking again, delivering a New Revelation to meet the critical and escalating needs of a global humanity, now facing Great Waves of environmental, political and economic change and the world’s emergence into a greater panorama of intelligent life in the universe. To face and navigate this future, we need a New Message from God, for the great traditions of the past cannot prepare us for the thresholds before us. God’s progressive Revelation continues anew through a New Message from God, of which The One God is but a small part. The words of this text are a direct communication from God, translated into human language by the Angelic Presence that watches over this world, and then spoken through the Messenger Marshall Vian Summers, who has given over 30 years of his life to this process of Revelation. 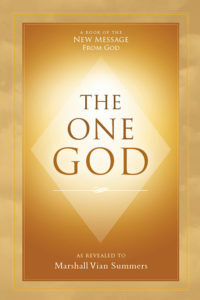 The One God is the second book of Volume 1 of the New Message from God. The One God contains 12 individual revelations, each given at different times and places during the Messenger’s journeys in the world. The Messenger has now compiled these revelations into this united text. The One God is a book of many teachings. It teaches us to go beyond our concepts and beliefs about God in order to explore our own experience of the presence and mystery of the Divine reality in our lives. It teaches us that, both in our world and throughout the universe, God redeems the separated through Knowledge—the spiritual intelligence and power that God has placed within each of us to guide, protect and lead us to a greater life of purpose and relationship. The One God opens a new vantage point from which to see ourselves and the world in which we live as never before. From this new vantage point, we can glimpse back into the origins of the universe and gain a new understanding of the great Separation from God that gave rise to the evolution of all life and that ultimately explains our presence in the world at this time. With this, The One God offers us a unique experience and remembrance of the timeless state of Creation, from which we have all come and to which we will all return. This represents a new experience of God. Instead of being focused or fixated on pleasing God, fearing God, talking to God, fighting for God or running from God, we are invited into a new and deeper engagement with the mysterious Presence of the Creator and the power of Knowledge that the Creator has given us. In the end, The One God teaches that the greater reality and purpose of God is beyond the beliefs, concepts and definitions of any person, scripture or religion. Rather, God is now revealed as a timeless experience available to you and to all people—people of all religions and of no religion. God is an experience of remembrance, a remembrance of the Greater Reality from which we have come and to which we will return eventually. Here we find an intimate form of redemption—redemption from a life of separation, pain and confusion. Here we can begin to experience who we really are, where we have come from and why we are in the world at this time. Though it appears to be a book in the hand, The One God is something far greater. It is a calling and a communication from the Heart of God to you. In the pages of this book, God’s Presence calls to you and to all people, calling for you to awaken from the dream and the nightmare of living in Separation apart from your Source, calling down through the Ancient Corridors of your mind to the spiritual presence and power that live within you, waiting to be discovered. The One God is part of a living communication from God to humanity. Remarkably, you have found the New Message from God, or it has found you. It is no coincidence that this is the case. This opens the next chapter in the mystery of your life and of your presence in the world at this time. The door opens before you. You need only enter to begin. As you enter more deeply into the Revelation, the impact on your life will grow, bringing a greater experience of clarity, inner certainty and true direction to your life. In time, your questions will be answered as you find growing freedom from self-doubt, inner conflict and the restraints of the past. Here The One God is speaking to you directly, revealing to you the greater life that you were always destined to live.